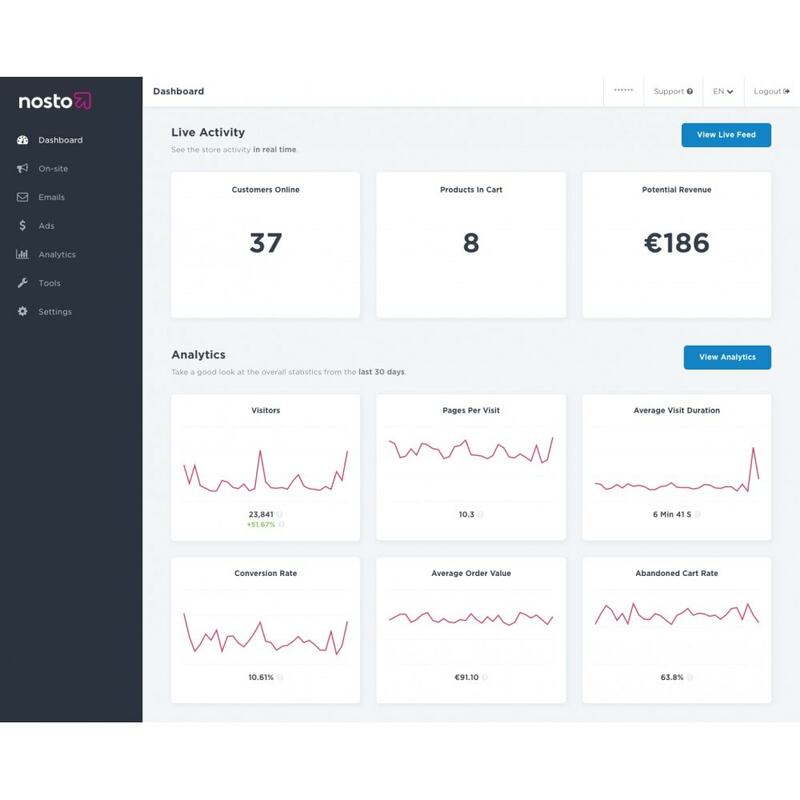 Nosto harnesses big data to build a deep understanding of every customer in real-time, automatically predicting and delivering the most relevant shopping experiences wherever your customers are. ...all the personalization tools you need in one solution. Monthly plans have no set up costs and start from as little as $/€ 99 + 0.5% of online sales for merchants selling less than $/€ 1,000,000 per year. Pay only $/€ 99 per product (valid for Onsite Product Recommendations, Facebook & Instagram Ads, Onsite Pop-ups, Personalized Emails) if your online sales do not exceed $/€ 20,000 per month. 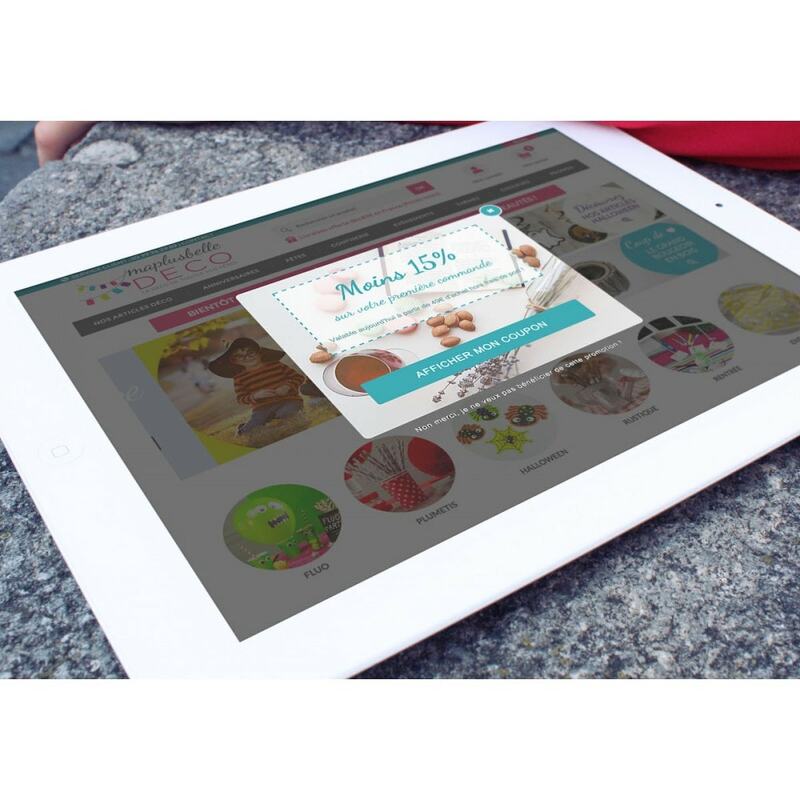 If your online sales exceed $/€ 1,000,000 per year and you need additional assistance, please contact our ecommerce specialists at https://www.nosto.com/request-demo/ to advise you on the best pricing plan for your business. Onsite Product Recommendations - Recommend shoppers the most relevant products in real-time based on their unique user behavior. 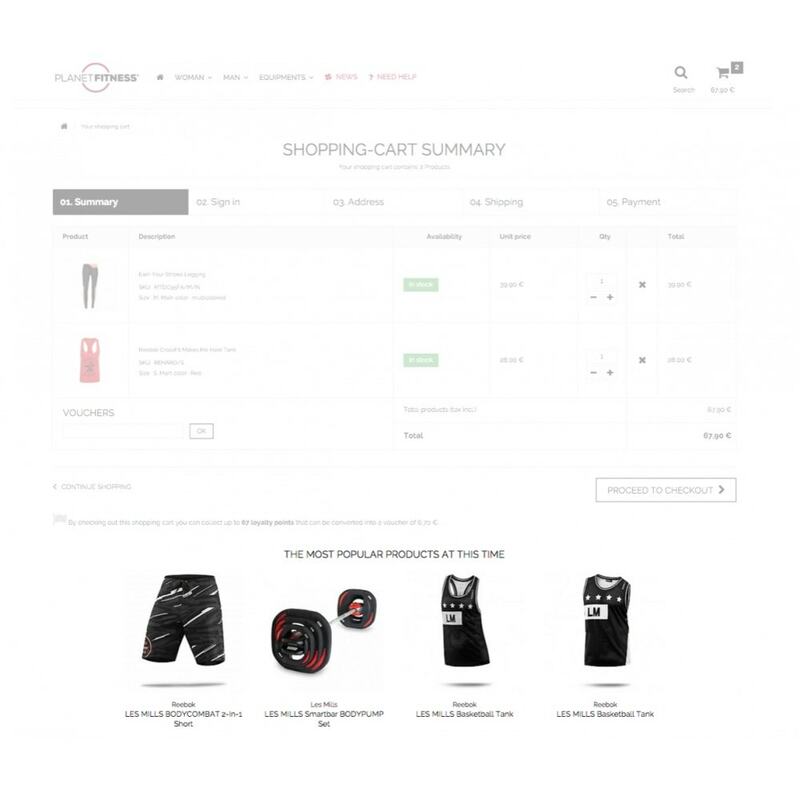 Onsite Content Personalization - Go beyond product recommendations to personalize the entire store experience - from the navigation bar to banner imagery, logos, videos and more. Segmentation & Insights - Target shoppers based on their behavioral preferences and position in the buying funnel. Surfacing real-time behavioral and transactional data to guide your business strategy. 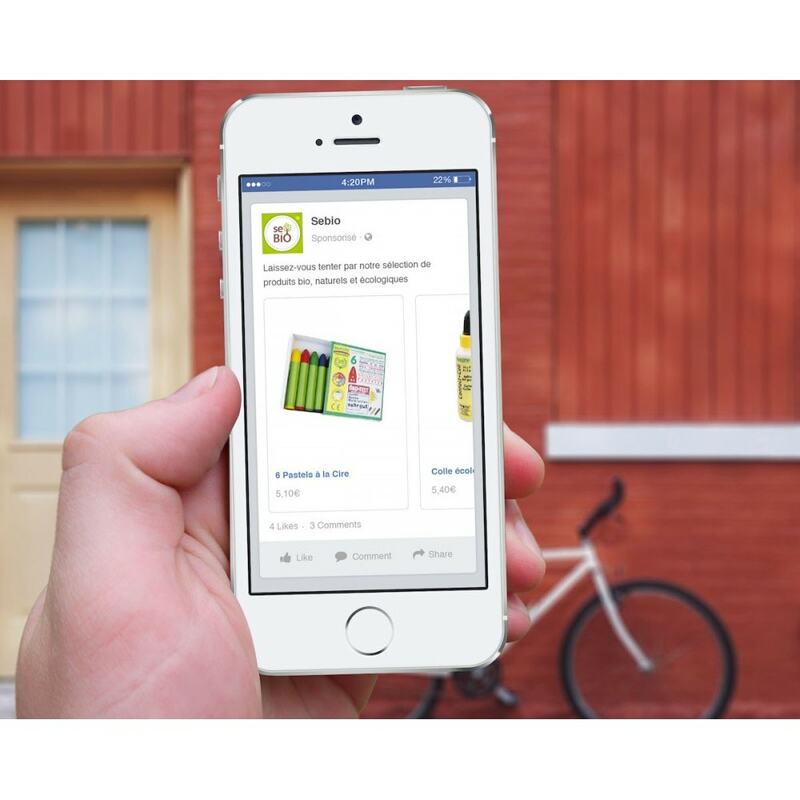 Onsite Pop-Ups - Offer discounts and capture emails with timely, targeted pop-ups. Personalized Emails - Reconnect with your customers through automated, personalized emails. Developed with busy ecommerce professionals and ease of use in mind, Nosto is the most effective way to build and launch personalized marketing campaigns without the need for dedicated IT resources. 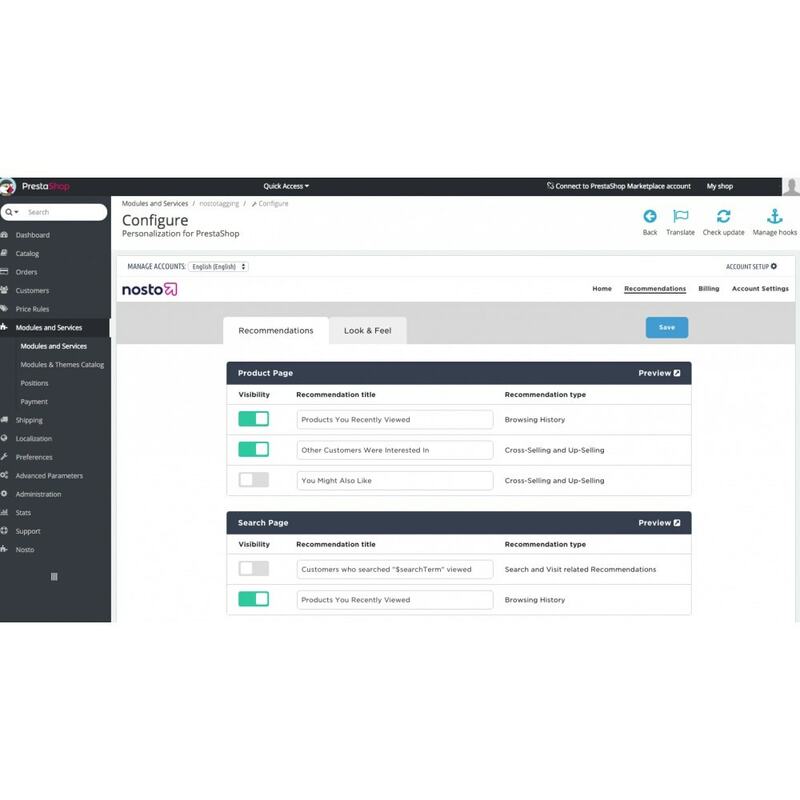 The seamless integration on Prestashop ensures that your rich data isn't being locked away in silos, but can be accessed and utilized efficiently through one complete personalization solution - Nosto. Important note: Powerful personalization needs a lot of data fuel! For that reason, to really see the benefit of Nosto you need have over 30,000 visits per month. The module is bundled in 1.4.0.1 to 1.7.5.0 and can be found under the "Advertising & Marketing" section of the modules listing. For 1.4 please download and install the module from Prestashop Addons.